Having passive income means money is coming to you without you having to work for it and that is a great feeling! We owe it to ourselves and our families to prioritize and make sure we have several sources of passive income! When you do, you will have plenty of time to spend on what you really want to do in life! 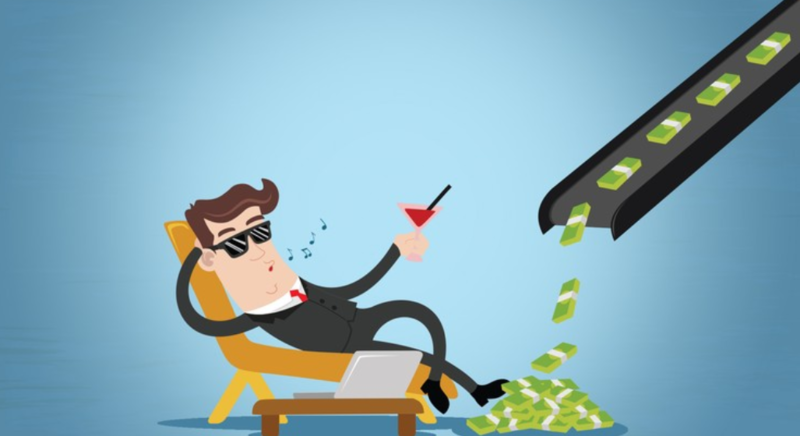 The additional benefit of having passive income is that you will never be stressed about money and there will be even more opportunities coming your way. When you have money constantly flowing your way, you will make it your business to activate the money again and again and again! First you should of course automate your savings and investments so that they happen for you (see our post on The Bucket System – Automating your Finances). Then once it just keeps growing, you might have to become a bit more creative to activate your money (make your money work for you) but again, the more you have, the more ideas of making more you will come across! It is not about having assets as assets won’t pay your bills. We should focus on cash-flow because that is what we need and ideally passive cash-flow generating ideas until we have enough passive income to pay for all we need. That should really be everybody’s goal, not working to get a salary, spend the salary and then work again to get a new salary. That is never ending work and those who do this all their lives, might have to work all their lives! Do you want to be one of them? If not, it’s time to start thinking, planning and executing for a life with massive passive income! Basically, you should strive for making passive income instead of exchanging your time for money! A savings account – Might be low returns but completely passive. Financial investments – they require initial capital and knowledge (and there are risks associated) but once you have invested and if they are coupon paying securities (like bonds or dividend paying stocks) then you don’t have to do anything, just relax and enjoy the coupon payments! Real Estate Investment Trusts (REIT), gives you exposure to the US property market (mainly) and they pay a high dividend and you don’t have to do anything but receiving the dividends (again there are risks associated with financial investments). Peer To Peer lending or other lending clubs, where you lend money to other people or organizations, normally the interest is much higher than at the bank but the risk is of course also higher. Rent out a property: depending on your setup it will most likely not be completely passive but many people like this because they can own an asset and normally finance a large part with a loan. This gives them leverage on their investment and the return on the invested amount can be significant. Though make sure you have the set-up you want to make it as passive as possible. Rent out a room or part of your property via Airbnb, you already have it and it can generate some good cash. You will of course have to handle some visitors and a booking system but it’s almost passive and can generate quite a bit of extra income depending on the location of your property. Write an e-book on something you are passionate about and sell it on Amazon. You just have to upload it once and it can give you income 24/7 with no additional work (if you want it to fly, you will most likely have to do some marketing though). Start an online shop. It has never been easier and you don’t even have to hold any products. For example you can set up a shop via shopify.com (looks good and easy to use), source your goods directly from Alibaba as they are already connected with Shopify and they will send your product directly to the customer! Of course you have to make sure you have a good product and do some marketing but if you get it up and running it can be rather passive and very, very lucrative (and if you make a lot of money you can hire someone to do work for you:))! Create an online course and sell it on a platform like Udemy. Quality is increasing so make sure you are up for it but it can be done in different formats and on different topics. Again, once it has been done it’s there and you just have to wait for the cash to come in (or, again, do some marketing to make sure the cash is coming in). Create a blog (with a tool like WordPress, which makes it very easy) for a niche product, add some valuable information and sell advertising on your site. Become an affiliate marketer (selling other people’s products online). You need to be able to draw customers to the company which you are affiliating for. So if you have a website, then you can add affiliate links via for example Clickbank and when a customer clicks on your link and then makes a purchase from the site you are linking to, you will make money. These are just a few of the things you could do and each “category” can be expanded into many different alternatives. I would say that the most important thing for you to do now is to THINK about something that interests you and how you can make a passive income out of that interest. Because if you already have knowledge, you are way ahead of most people and it will make your solution stand out. Perhaps one of the above suggestions could help you monetize that idea. Just imagine what you could do if (read when) you had different sources of passive income! Personally I am constantly working to expand my revenue streams and I am currently involved in all of the above and for sure there is more to come! Take the first step now to monetize your idea and if you are unsure of what to do, drop me a line and I will help you out on how to get started!